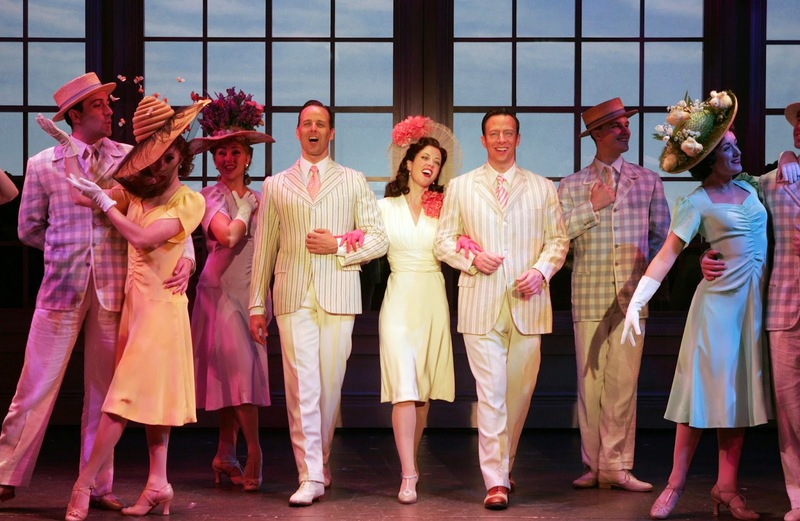 "Easter Parade" with the cast of Irving Berlin's "Holiday Inn"
There’s a new star in the theatrical firmament, and his name is Irving Berlin. Well, maybe not exactly new, but certainly renewed, thanks to the current production of “Holiday Inn” at Goodspeed Opera House. For devotees of the classical film musical, the plot and many of the songs will be familiar. This production, with a book attributed to Gordon Greenberg and Chad Hodge, (also directed by Greenberg), follows the plot of the film closely, with some added humor and characters. It’s 1946, and the “jewel box” stage of Goodspeed’s theatre itself becomes the inn, in the fictional town of Midville, CT. As Greenberg has said elsewhere, it’s about “ambition and its impact on friendship, reality vs. its reflection on screen, and the value of personal gumption.” Most importantly, he stressed, it “celebrates show business and joys of live performance.” The score includes the melodic Irving Berlin songs from the film, (such as “Happy Holiday” and “Easter Parade”), as well as other favorites that audiences will recall from other sources. At the opening night, it was obviously a huge hit, with the audience dancing in the aisles (some quite literally), and there was joy in Midville. The cast was pluperfect, especially the leads, the singer/composer Jim (Tally Sessions), his dancing rival Ted (Noah Racey) and the you’re-going-out-there-a-nobody-but-coming-back-as-a-star Linda (Patti Murin), as well as the second banana Lila (Hayley Podschun) and “handyman” Louise (Susan Mosher, as a sort of gay Thelma Ritter, the only idea that seems ahead of its time). Excellent support is provided by talent agent Danny (Danny Rutigliano) and young Charlie (Noah Marlowe). The large ensemble, every one of them just wonderful especially with respect to their dancing, includes Alissa Alter, Abby Church, Darien Crago, Caley Crawford, Jeremiah Ginn, Juliane Godfrey, Laura Harrison, Bryan Thomas Hunt, Charles MacEachern, Karl Skyler Urban, Amy Van Norstrand, and John T. Wolfe. The expert Musical Direction is by Michael O’Flaherty, with versatile Scenic Design by Anna Louizos, colorful Costume Design by Alejo Vietti (with some hilarious Easter hats), fine Lighting Design by Jeff Croiter and Sound Design by Jay Hilton, as well as Wig and Hair Design by Mark Adam Rampmeyer. The Choreography by Denis Jones is infectious. One might have some reservations, however. As with other jukebox musicals, there are some odd inclusions shoehorned into the score without much regard for relevance. Some are hopelessly sentimental (“Be Careful, It’s My Heart”) and unsubtle (“Song of Freedom”), but then there are such gems and chestnuts like “White Christmas”, and reminders of precisely why Berlin’s music endures, such as the beautifully plaintive “What’ll I Do”. It’s not unlike a generous holiday dinner in which there are too many dishes leading to a feeling of being overstuffed. With close to three dozen songs including reprises, this would be easy to correct; sometimes less is truly more. Your appreciation for this version of “Holiday Inn” will largely depend on your attitude toward the film musicals of the 30’s and 40’s, as this work (except for a few topical references and that ‘handyman” role) is amazingly true to the period, in both the good and bad sense. It has just about every convention of the genre intact, as though it truly had been written and assembled in the 40’s. Greenberg has also said that the story is about “the beauty of being true to yourself, living simply and…a great big party. And isn’t that what holidays are all about?” At this “Holiday Inn”, indeed they are.